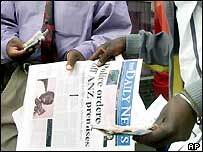 A Zimbabwean court has dropped charges against four directors of the banned Daily News newspaper. The privately-owned paper was shut down a year ago by police under the country's tough media laws. The magistrate said there was insufficient evidence to show they had published the paper illegally. But the publication will stay off the news-stands pending a decision by the Supreme Court on the constitutionality of the media legislation. Zimbabwean and international rights groups have condemned the law, which compels all journalists and newspapers to be accredited by a government-appointed media commission. Magistrate Lillian Kudya said the state failed to prove the paper intentionally violated the law, as the paper had won court cases granting the paper a licence, AFP news agency reported. "We are free. We knew justice was going to prevail," said Samuel Nkomo, the paper's chief executive after the ruling. Launched five years ago, the Daily News was the country's sole privately-owned daily paper and was a persistent critic of President Robert Mugabe's government.